Mercedes-Benz offered a glimpse into the commute of the future at International CES in Las Vegas today, with the unveiling of the extremely futuristic-looking Mercedes-Benz F 015 Luxury in Motion concept car. Keynote speaker Dr Dieter Zetsche said the most important luxury goods of the 21st century are ‘private space and quality time’ and the car will thrive because autonomous driving will offer these. Describing it as an ‘automotive revolution’, he said that cars will be ‘rethought in terms of shape and design, in terms of outside interaction and in terms of inside interaction’. He said it’s about widening the functionality of cars for them to become a third space between home and work where people can simply ‘hang out’. 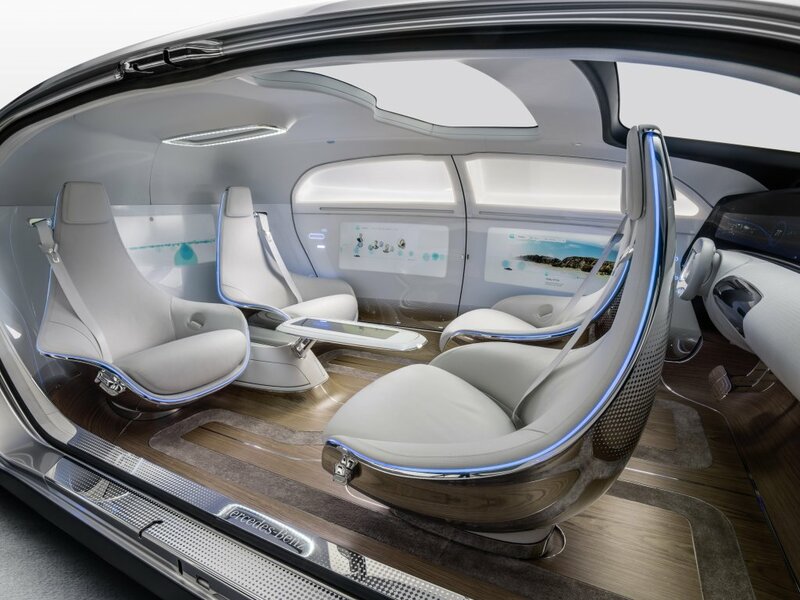 While the car does have a physical steering wheel, everything can be ‘steered by gestures, eyetracking and other interactive elements that surround the passengers’. There’s also state of the art video conferencing. The four seats are pod-like swing chairs. In terms of pedestrian safety, the car can display a zebra crossing on the street, telling walkers when it’s safe to cross. 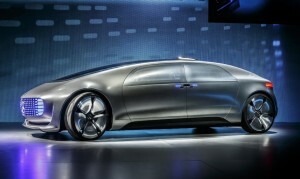 This makes it ‘smart, polite and helpful’, Dr Zetsche said. Volkswagen was also on the gesture control track today. Revealing the Volkswagen Golf R Touch concept, Dr Heinz-Jakob Neusser said it ‘offers a preview of Volkswagen’s future interior technologies’. Boasting three displays, the Golf R Touch looks like a traditional Golf R on the outside, but inside the centre console is simply a 12.8in touchscreen. The instrument panel in front of the driver is replaced by a customisable 12.3in display unit and the third screen is an 8in control unit. Gesture control can be used for everything from closing the sunroof to increasing the volume, to turning up the air con. Dr Neusser explained that it’s operated via a 3D camera located in the roof, which ‘detects hand gestures and converts them into commands’. ‘With a swipe of your hand, all systems can be controlled,’ he said. Volkswagen also announced that it will introduce Apple’s CarPlay and Google’s Android Auto infotainment apps into cars later this year. This coincides with the launch of MirrorLink, which brings the apps and operating layouts of numerous smartphone brands into Volkswagens. Meanwhile, Toyota announced that it is opening up its hydrogen fuel cell patents to encourage other companies to develop such technology. It also showcased the hydrogen-fueled Toyota Mirai production car, which in Europe will go on sale in the UK, Denmark and Germany in September. More markets will be announced for 2017. Ford CEO Mark Fields used his keynote speech to announce Ford Smart Mobility, its plan to ‘introduce innovation to take Ford to the next level in connectivity, in mobility, in autonomous vehicles, in the customer experience and big data’. He said that while getting a fully autonomous Ford car on the road is important, it’s not in a race to get there first. ‘Our priority is making the first Ford autonomous vehicle accessible to the masses and truly enhancing our customers’ lives’, he said. As part of Smart Mobility, Ford is conducting a series of 25 experiments across the world in areas such as car swapping, driver behaviour, car sharing programmes, fast charging for electric vehicles and cloud-based parking spotting technology.